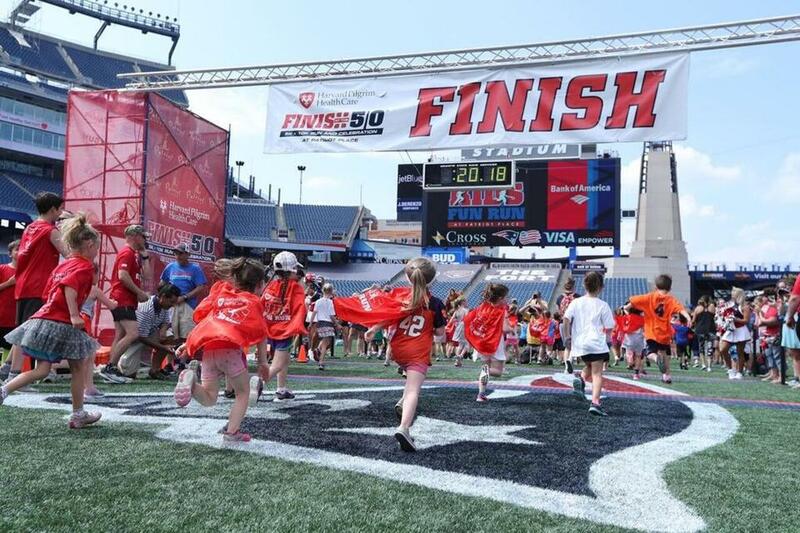 Children ranging in age from two to 12 ran to the 50-yard finish line at Gillette Stadium July 3 to benefit the One Mission foundation, a childhood cancer charity. On July 3, nearly 6,000 racers participated in the annual Harvard Pilgrim Finish at the 50 races in Foxborough. Children ages 2-12 ran a lap to the 50-yard finish line in Gillette Stadium at One Patriot Place. The 5k participants ran through the Patriot Place campus, while the 10k runners swept through the campus and sprawled onto Foxborough roads. Spectators cheered on the runners as they crossed the 50-yard line at the stadium. After the races, a fireworks spectacular entertained the crowd at North Marketplace. A portion of the proceeds will be donated to One Mission, a foundation that offers programs and services to children with cancer and their families. For more information, visit www.finishatthe50.com. The Duxbury Rural and Historical Society invites mothers and children to its first-ever Doll Tea by the Sea. The event will take place at the King Caesar House by the waterfront Wednesday, July 18 from 1:30 to 3:30 p.m. For $25 a person ($20 for society members), families can learn to embroider, make teacup centerpieces, and tour the historic King Caesar House. Dolls are welcome, and encouraged. For tickets, which will not be available the day of the event, go to http://duxburyhistory.org/. The Mansfield Public Library will host a workshop for current and future small business owners Thursday July 19. John Arnett, economic development specialist and administrative officer at the US Small Business Association, will provide an overview on counseling, lending programs, government contracting, and disaster loans. Arnett, a Marine Corps veteran with a bachelor’s and master’s from the University of Connecticut, works to connect small business owners with resources and provide insight on lending processes. The workshop, which is free and open to the public, will begin at 6 p.m. at 255 Hope St., Mansfield. Advance registration is recommended. To register, visit www.mansfieldlibraryma.com. The Easton Food Pantry received a $2,000 donation from the Chamber of Commerce to continue providing food to residents in need. Chamber of Commerce President Mark Lombardi presented the check to pantry co-founder Ken Wood and volunteers Gerry Griffin and Glenn Riskin on July 2. The funds were collected from ticket sales at the 2018 Taste of Easton event. The food pantry has been serving the town for over 40 years. It is run mostly by volunteers, who help sort and distribute food to as many as 70 families a week. On July 27, Hingham’s Department of Veterans’ Services will award over a dozen Korean War Veterans with “Ambassador for Peace” medals for their wartime service. The program initially awarded the medals to veterans who returned to South Korea after the war through the “Revisit Program,” but has been expanded to honor those who cannot make that journey. To qualify, a veteran must have served in the Korean War, which was fought from June 25, 1950 to July 27, 1953. Medals can be awarded posthumously to the veterans’ next of kin. A wreath-laying ceremony is to follow the medal presentation at the town hall at 210 Central St. For more information, visit www.mass.gov and enter “Republic of Korea Veterans Ambassador for Peace Medal” in the search box, or call 781-741-1440. Aidan Doust of Marshfield, a Quincy College student, has aced his final project for a course in aquaculture. After 100 hours of work, the student engineered a 3-D printed, five-pound model of an automatic shellfish upwelling process, or a silo cleaner. If built to real-word scale, which Doust hopes will eventually happen, the pump-powered machine could potentially reduce the labor of workers. “The weight of the silos can range from 25 to 50 pounds,’’ said professor Chuck Martinsen. “This can lead to injury and a decline of the number of workers in aquaculture long-term.” Doust taught himself how to program, design, and assemble the model. When faced with challenges, he doubled down. “I even turned my bedroom at home into a laboratory of sorts,’’ he said, “with electronics, soldering equipment, circuit boards, and drawers full of wires.” For more information, visit www.quincycollege.edu and navigate to the “News” tab. One lucky biker can win a classic motorcycle formerly owned (and signed) by Boston rock icon Steven Tyler of Aerosmith in Bridgewater this week. The yellow 2008 Dirico bike with a Harley-Davidson Screamin’ Eagle 103 cubic-inch engine is being donated by Mike Dirico of Dirico Motors. It will be auctioned off at the Bridge Center’s 27th annual Rudofsky Family Memorial Golf Tournament to support programs for children and young adults with disabilities. The tournament and auction will be held Monday, July 16 at Olde Scotland Links Golf Course. Registration for the tournament is from 9 to 11 a.m. To place a bid or for more info, contact jwalsh@thebridgectr.org . Bidding is open to all. Cynthia Fernandez can be reached at cynthia.fernandez@globe.com. Morgan Hughes can be reached at morgan.hughes@globe.com.